Sales of European and United States fries to the Malaysian market dropped at the beginning of 2019 as prices rose on average by nearly 10%. Shortages of supplies for European processors saw the involvement of the Dutch, Belgian, German and Danish suppliers drop back. Over the course of the year they have been able to make significant inroads in what had traditionally been a strong market for the United States. Year-to-date, US imports are down 7% while the market has grown by 10.7%. 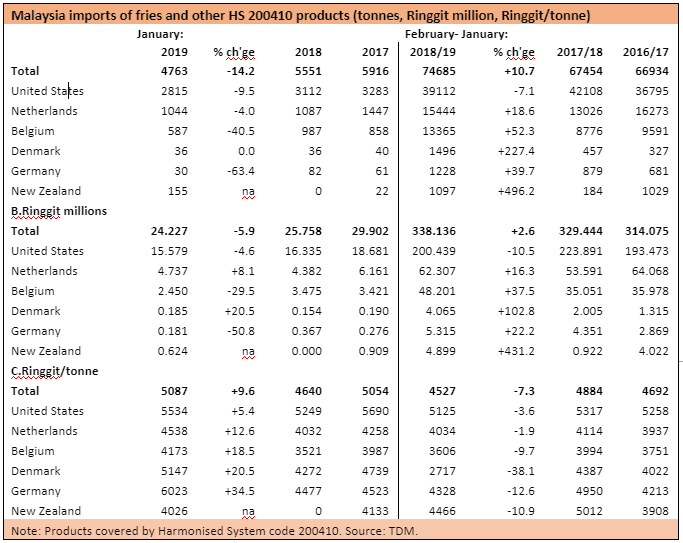 This has allowed the Dutch to increase their share by 2 500 tonnes and the Belgians by 4 500 tonnes, although the Dutch remain the second largest player in the market place. Denmark and Germany have also increased their commitment, with both countries now importing over 1 000 tonnes of processed product over the course of the year. The shortages of supplies in Europe has meant higher prices with rises of 12-34% for product from European importers. The Dutch are now importing at Ringgit 4 538/tonne (US$1 116/t; €986/t) and Belgians Ringgit 4 173 (US$1 026/t; €907/t). The price of US fries has also risen, but by only 5% and they continue to enjoy a slight premium at Ringitt 5 534/tonnes (US$1 361/t; €1 203/t). All this has created an opportunity for a new entrant with a geographic advantage to come to the market: New Zealand. The Kiwis imported 155 tonnes in January, which puts their imports over the 1 000 tonnes mark for the year. And the price, at Ringgit 4 026 (US$990/t; €875/t) undercuts rest of the players- even the Belgians.